A Year of Being Here: Adam Zagajewski: "Try to Praise the Mutilated World"
Adam Zagajewski: "Try to Praise the Mutilated World"
"Try to Praise the Mutilated World" by Adam Zagajewski. Translated from the Polish by Clare Cavanaugh. Written more than a year before the terrible events of 9/11. Published in The New Yorker, September 24, 2001. Photography credit: Photograph from a series entitled "Photos: America commemorates 11th anniversary of 9/11 attacks" (8 of 14), by AP/Jason DeCrow (originally color). 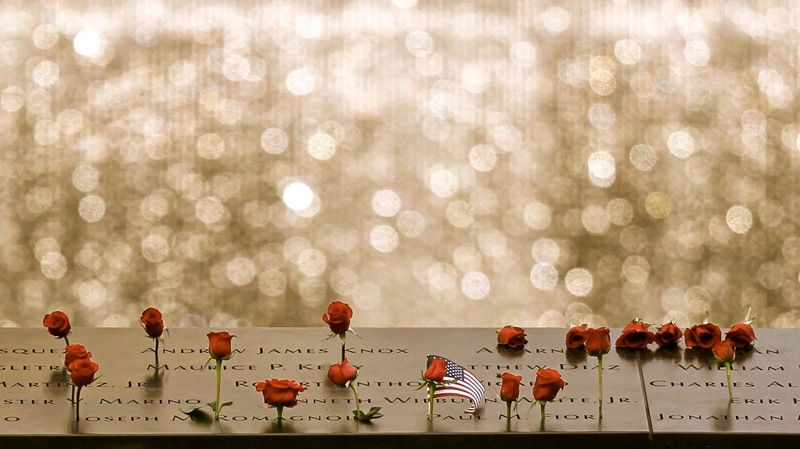 Caption: "Roses and a flag left by mourners adorn the names of victims of 9/11 during a ceremony marking the 11th anniversary of the attacks at the National September 11 Memorial at the World Trade Center site, Tuesday, Sept. 11, 2012, in New York."